Want to become a confident, successful leader? Do you want to advance your communication and leadership skills in a fun and supportive environment? 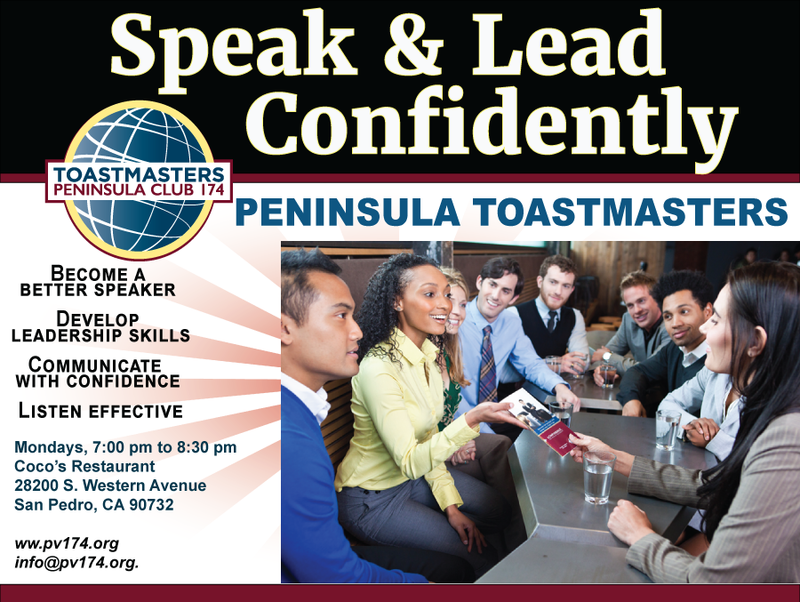 Peninsula Toastmasters is the club to join! We meet every Monday evening from 7:00 pm to 8:30 pm, We meet at Coco’s Bakery Restaurant on 28200 S Western Ave, San Pedro, CA 90732. When you join, you will be able to enroll in Testaments International new communication and leadership curriculum. Reach your personal and professional goals through Pathways, Toastmasters’ new education program. Build the real-world skills you’re looking for with a user-friendly online learning experience you can customize to fit your needs. Want to learn how our club can help you grow? Visit Our Club! Serving the South Bay region of Southern California (Palos Verdes Peninsula, San Pedro, South Torrance, Lomita, Wilmington, Harbor City) for over 37 years, we are committed to helping grow better communicators and leaders. We are a community club that is welcoming, warm, fun, engaging and strives to create a great learning experience. You will learn something new every time you attend, without even trying; and you’ll have fun doing so. Still need more information? Chat with us! Come see us! The mission of our Toastmasters club is to provide a mutually supportive, positive learning environment in which every individual member has the opportunity to develop oral communication and leadership skills, which in turn foster self-confidence and personal growth. Our club is open to the community and is an upbeat, supportive fun place to spend your Monday evenings learning leadership skills by doing. A Peninsula Toastmasters club meeting is structured so that participants hone their speaking and leadership skills in a no-pressure atmosphere. We practice public speaking in the form of formal speeches and impromptu speaking skills. We practice and grow leadership skills by giving club members roles at each meeting and opportunities to serve as officers. You must be 18 years or older to join our club. Membership dues for Peninsula Toastmasters is $63 every six months ($45 is for Toastmasters International and $18 supports club level activities and materials. New members will pay an additional $20 (plus $1.60 tax) to cover the cost of your manuals and other materials, sent to you by Toastmasters International. For more information, submit your question via email to info@pv174.org. 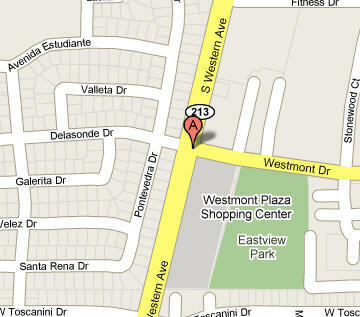 Peninsula Toastmasters Club #174 Meets Mondays, 7:00 to 8:300 pm at Coco’s Restaurant on 28200 S. Western Avenue, San Pedro, California 90732. We are on the border between Rancho Palos Verdes and San Pedro in Southern California.